CLEVELAND, Ohio – Saturday night, a dream began for a wonderful young couple. You might even say it began in a flash. But what she didn’t know is that her boyfriend Cameron, who also serves in the National Guard, had a plan up his sleeve. “Everybody here is in on it, but she has no idea,” said Fox 8?s Elisa Amigo, Cameron’s sister. 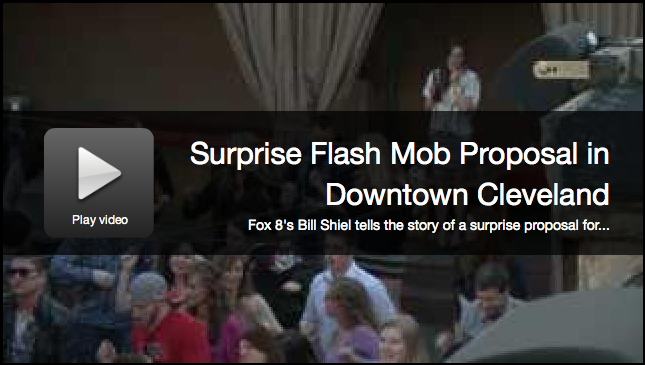 The song starts to play, and everyone on the roof breaks out into a flash mob. But then, to Brooke’s surprise, Cameron joins in. The mob, filled with many of their friends and family, finishes their dance by forming a tunnel. The couple runs through, and at the end Cameron pops the big question. She, of course, says yes.